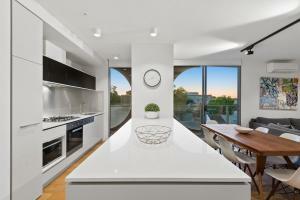 Great apartment in a cool area, very close to the lively streets of Fitzroy. The apartment is in an excellent location. The cooking facilities are adequate. The bed was really comfortable. There is no reception the key was left in box all worked perfectly put in a code for key. Didnt have any contact with staff didnt need to. Would maybe be a problem if you were wanting to store luggage if you had a late flight . we left early morning and used uber taxi . You need to walk block to main street if you want to hail a taxi. Loved how central to everything the apartment was. Great place, central to all our needs. Big choice of eating places, Very quiet considering inner city. Very good location. Great kitchen and all other facilities. This apartment is in a great location (close to hospitals, trams, Brunswick & Smith Streets), eventhough it is close to cafes, pubs etc we found it very quiet (we stayed over a weekend period) It had everything we needed for our two week stay. Just a word of warning - this is NOT a hotel, there is no reception (bookings.com office kept telling us to go to the reception desk???) so make sure you know the exact time you are arriving. I guess you receive a notification of some kind to enter the building and then apartment, however we didn't and had to message bookings.com and wait for the cleaner to arrive and let us in. Overall if we needed to stay in the area again certainly would use this accommodation again especially now we know how their processes work. Good quality materials e.g. Miele cook tips. Good design layout. 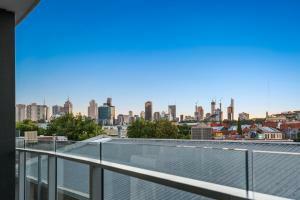 Lock in a great price for District Apartments Fitzroy – rated 8.7 by recent guests! 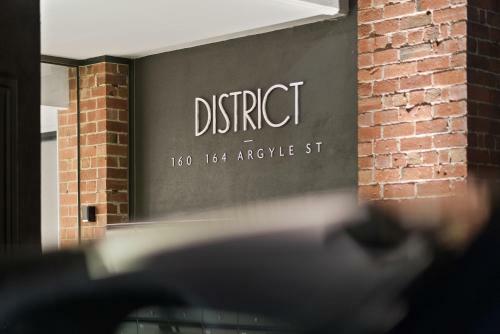 District Apartments Fitzroy This rating is a reflection of how the property compares to the industry standard when it comes to price, facilities and services available. It's based on a self-evaluation by the property. Use this rating to help choose your stay! 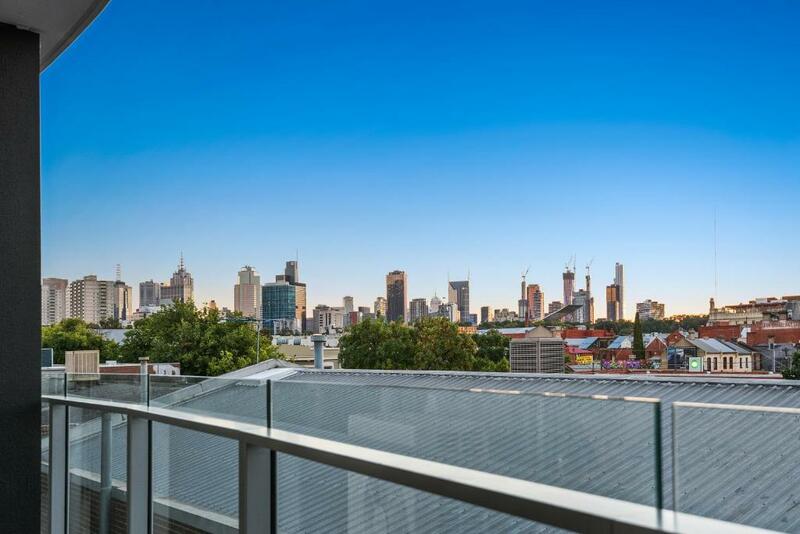 One of our top picks in Melbourne.Set within a 13-minute walk of Melbourne Museum and a 19-minute walk of Princess Theater in Melbourne, District Apartments Fitzroy provides accommodations with free WiFi limited parking is available on site. Guests can enjoy a meal on Brunswick Street, a 4-minute walk away. The air-conditioned units have a fully equipped kitchen with a dishwasher and an oven. A microwave and toaster are also provided, as well as a coffee machine. Guests can relax in the living area with a flat-screen TV. Laundry facilities are available for use. MCG Melbourne is 1.4 mi from the aparthotel, while Regent Theater is 1.4 mi from the property. Melbourne Airport is 11 mi away. Fitzroy is a great choice for travelers interested in culturally diverse food, entertainment and cafes. When would you like to stay at District Apartments Fitzroy? This air-conditioned apartment features a fully equipped kitchen, a dining setting and laundry facilities. Public parking is available on site (reservation is needed) and costs AUD 25 per day. This apartment features a microwave, washing machine and electric kettle. District Fitzroy offers spacious brand new apartments in the trendy hub between Brunswick and Smith Streets. All have a fully equipped kitchen with Miele appliances, washing machine & dryer, 50 inch smart TVs, air conditioning, premium bedding and coffee machines. Limited Car parking is available onsite, Height and weight restrictions apply, please speak to our reservations team as the car park must be pre-booked with your reservation. Area Info – This neighborhood is a great choice for travelers interested in culturally diverse food, entertainment and cafes – Check location Excellent location – show map Guests loved walking around the neighborhood! 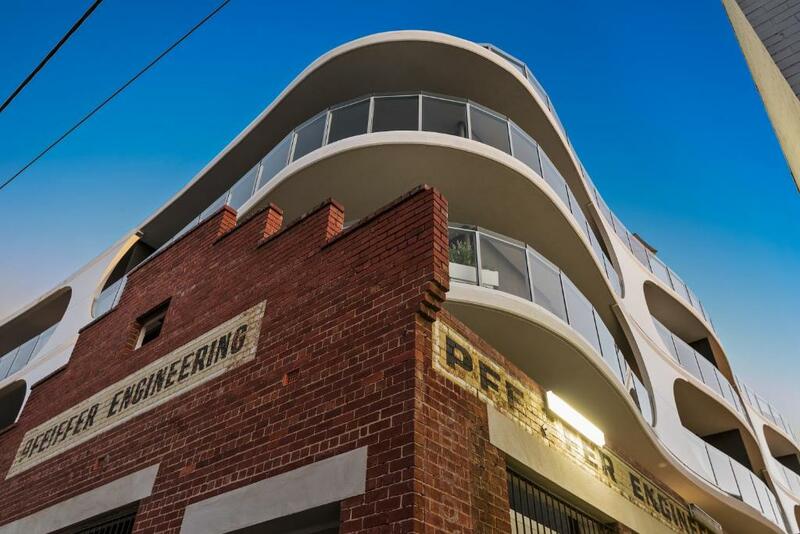 House Rules District Apartments Fitzroy takes special requests – add in the next step! A AUD500 damage deposit is required on arrival (around USD356.68). This deposit will be fully refunded 7 days after check-out, as long as there isn't any damage to the property. 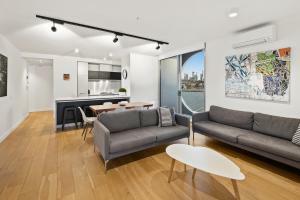 District Apartments Fitzroy accepts these cards and reserves the right to temporarily hold an amount prior to arrival. Payment will be taken at time of booking. Please note that there is a 1.5% surcharge when you pay with a Visa or Mastercard credit card and there is a 3.3% surcharge when you pay with American Express credit card. 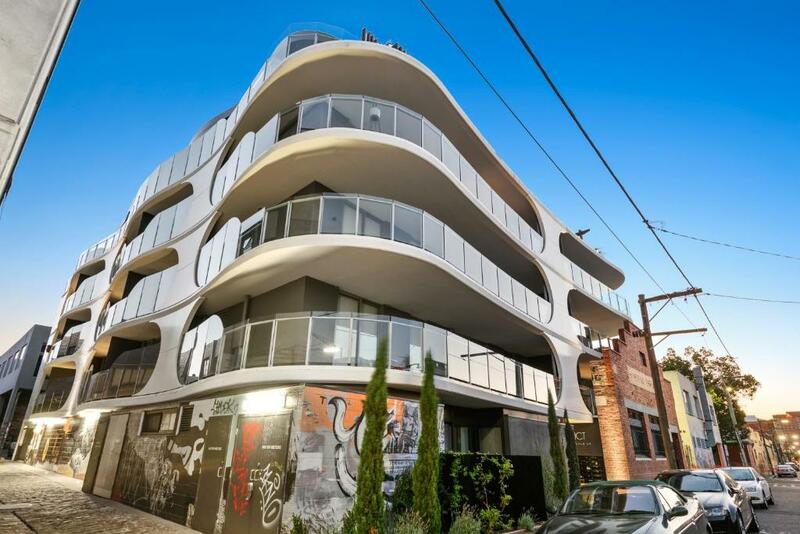 Please inform District Apartments Fitzroy of your expected arrival time in advance. You can use the Special Requests box when booking, or contact the property directly using the contact details in your confirmation. A damage deposit of AUD 500 is required on arrival. That's about 356.68USD. This will be collected by credit card. You should be reimbursed within 7 days of check-out. Your deposit will be refunded in full by credit card, subject to an inspection of the property. View was not good and large rubbish bins outside brought smell into apartment. Checking in and out is a hassle, particularly with a car e.g. needing to find a street park, going on to collect keys and stacker remote control from kitchen bench, collecting car, using car stacker, etc. Checking out - needing to temporarily park car in street while returning keys and car stacker remote to kitchen bench in apartment. Only one 2-seat couch. Plenty of space for two. Black pepper grinder didn’t work at all. The wiFi never worked after 3 calls to fix it and we were not given an extra key as requested. We were forced to find cafes with wifi and coordinate our schedules due to having one key for two people to share. Fantastic location, very close to all amenities, coffee shops, etc. Nice and quiet street. The booking confirmation process was overly lengthy. 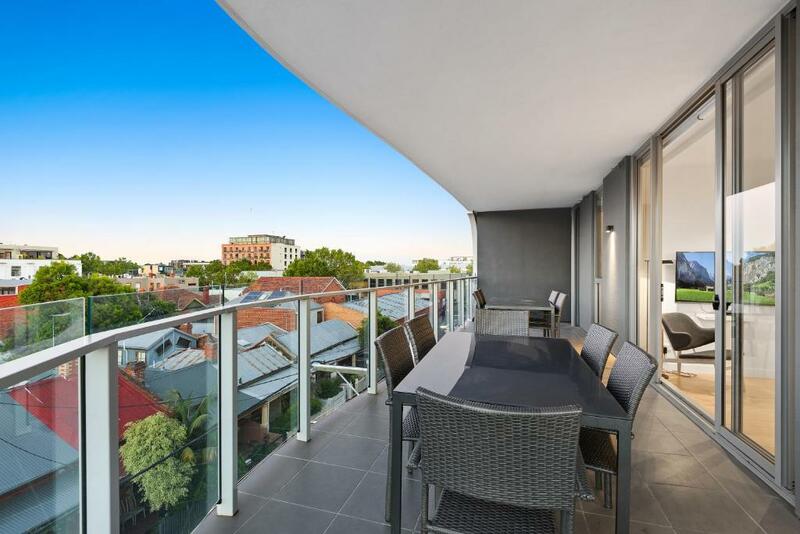 The location was very good if you want to stay right in the heart of Fitzroy. 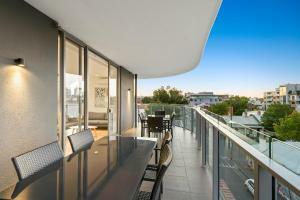 The fully appointed and furnished apartment is perfect if you are wanting to cook. It was all great, the only issue we had was with check in - we had received such detailed instructions but when we went to the key box our key wasn’t there. I called the helpline and got help quickly, which was great, but a seamless check in often helps especially after long journeys. This apartment was clean, comfortable and had everything we could have needed - laundry, dishwasher etc along with a nice warm balcony for sunny evenings. The location was absolutely fanstastic, which was the real highlight, so many great local places within minutes of the property, but equally right next to the tram for getting into town. We will definitely stay here again when we return to Melbourne.